Put a few pounds on and the belly is looking a little flabby, well not to worry because there is a great app called “Ab Workouts Pro” for the iPhone that will help you lose weight, whilst getting rid of that dreaded belly fat. 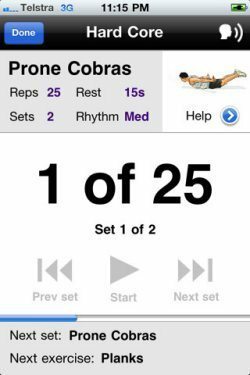 Ab Workouts Pro is only Â£1.19 (US $1.99) via the App Store or iTunes, and trust us you do not need steroids for this workout baby. This application has been specifically designed for all to gain a flat stomach. Once you have installed this app you will get options of simple abdominal exercises & workouts, own e-trainer, sign-up for tips and great news information and more info on what foods to eat. If you are looking for 6-pack abs then look no further. Main App Features Include: 10 all new workouts for all fitness levels, 20 easy abdominal exercises with steps & animations (Just click the play and learn), Your own personal e-trainer (via email), Design your own custom workouts, Foods that fight abdominal fat and an In-app trainer voice.